← GLEF’s First Desk Campaign—A Success! Join us Saturday, July 30, 2011 for Golden Leaf Education Foundation’s second annual auction gala, “On the Wings of a Dream”—an evening to Celebrate Cambodia’s rich culture, cuisine, music, dance and more while supporting Golden Leaf Education Founation’s mission to enhance educational opportunities internationally for children in need, in memory of genocide victims and in honor of survivors — golden leaves. This year the funds raised will be used to build a new school building at the Taing Krosaing Junior High School in Kompong Cham, Cambodia. 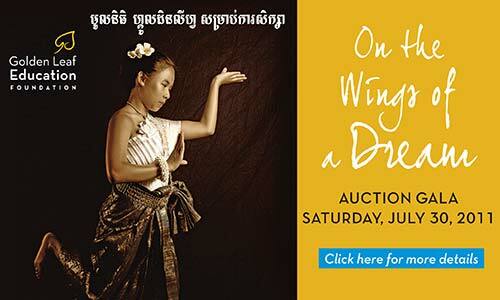 Enjoy delicious Cambodian delicacies prepared by Good Call Restaurant and Chunny Sok as you socialize, hear Young Master Vuthy Sek pay music of the Khmer tro and find treasures to bid on during the Silent Auction. Then join everyone in the auditorium for a beautiful program of music, song and dance. Aaron Meyer, internationally renowned concert rock violinist will once again start off the entertainment playing solo pieces and then a song with his student Kilin Ung, Kilong Ung’s son. The GLEF Humanitarian Award will be presented, there will be a live oral auction and paddle raise, special theme related songs performed by Todd Tschida and Satheara Sin, both accomplished Portland theater performers, with dancing by the American Classic Ballet troupe and Cambodian youth dancers, plus Cambodian classic dancers Bonnearin Sin and Sida Vong will round out the program. Local celebrities involved in GLEF’s “On the Wings of a Dream” include Michael Harper, ex-Trail Blazer, Rotarian and Royal Rosarian, who will conduct the live auction and Miss Oregon USA 2010-2011 Stephanie D. Steers along with Dave Salesky, chief meteorologist for KATU-Channel 2, who will be co-Masters of Ceremony. Click here to purchase tickets. Enjoy 10% off ticket prices until June 30, 2011!